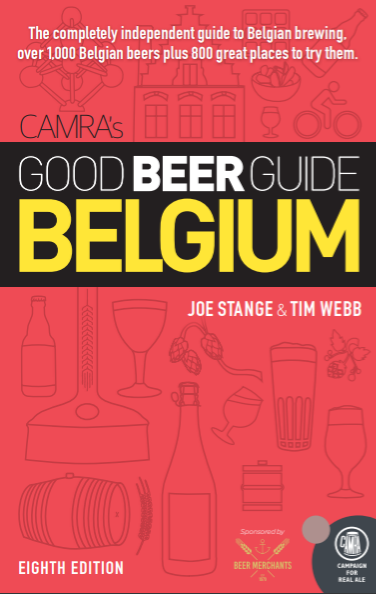 Thirsty Pilgrim: At the Mercy of Mad Scientists, and Ostriches, in West Flanders. 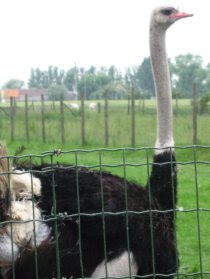 At the Mercy of Mad Scientists, and Ostriches, in West Flanders. The Struise brewers are the beer-geek darlings these days. Among those who sniff and swirl and sip from tulips and take notes on aroma and head retention, there's nobody hotter right now in Europe or even the U.S. Now, I hate being a crowd-following sheep. I've got a rebellious gene that begs me to ignore Struise and the hype and go get excited about something else. But I can't. Their beers are just too damned good. So the other day I hopped into a car with a friend and lucked into an adventure that took us to the Struise farm, tucked into the pastures of West Flanders. There are ostriches there. And a secret laboratory fit for mad scientists. And a brewery in a tent. Plus more than a few bizarre and delicious things to taste. Be wary, I thought. They will brainwash you with beer. The most impressive was the Dirty Horse. Let's call it a backyard lambic, equal parts patience, talent and insanity. Five years ago, the mad scientists left some wort out for two days, using a clean tarp and plastic tunnel as a coolship. I'm not totally clear on what happens next, but various snapshots from the ale's childhood would portray sherry casks, Rodenbach yeast and lots of cherries, followed by three years of adolescence in oak barrels. 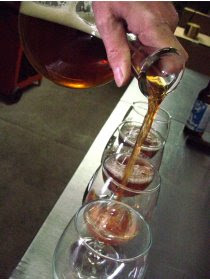 The final product takes five years and is intense, tart and funky at a reasonable 7 percent strength. The powerful nose offers cidery must, grapefruit and lemon, and those tart cherries in the backdrop. I sniffed. I swirled. I sipped. While there we also got to help brew a test batch for a top-secret beer. Sorry, can't tell you a thing about it. I only mention it to annoy you. And if the beer turns out any good, I'll claim full credit after personally stirring the mash for about five minutes. All in my patented figure-eight technique. Now comes the part where I level with you. For a while I've thought the Struise guys were geniuses at creating buzz among the geeks. The reality is much simpler. They are friendly dudes who make beers--in small batches--that are not only interesting but dangerously easy to like and drink. They also happen to be geeks themselves. They want to share their beer with you and talk about it. There is no secret here. Look them up and visit the farm. And if you really want to come out on top, bring them some IPAs.